Third Time is the… Ring! Cinnamon Buns’ ring is in! Again! I talked about it before, but the Cole’s Notes version is that there was this ring Cinnamon Buns liked, 7.5 was too small, 8 was too big. After that last post, the jewelers had said they were going to order the 7.5 back in (we’d sent it back when it was too small) and bore out the middle to make it into a 7.75 size ring. This would void the warranty on it, but at least Cinnamon Buns would have the ring he liked, right? Not having the warranty would just encourage him not to get too fat 😉 as it completely covers needing a new size. 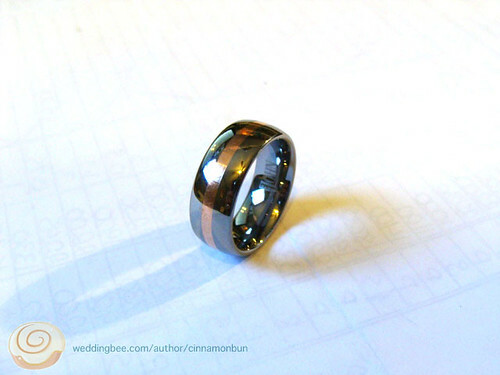 The ring is mostly tungsten, so you can’t just get a jeweler to re-size it. Well Kevin John (the design company) sent our jeweler a 7.75 ring, after they explained what was going on! And because our jeweler didn’t bore it out, the warranty is still good! We went in to this whole ring-buying-shebang not expecting to get matching bands – we were just going to get what we liked. Or in my case, get whatever I liked custom made to fit the stone. The funny thing is that this Kevin John ring that Cinnamon Buns fell for is tungsten with a rose gold stripe through the middle. 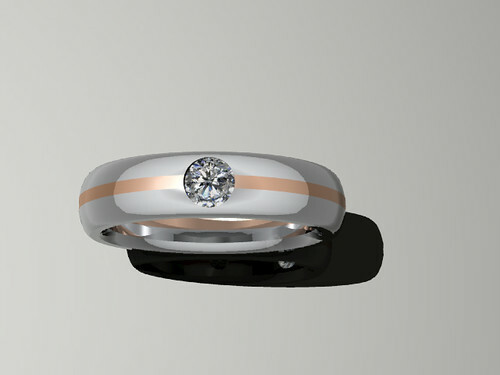 What I got custom-made was a white gold band with a rose gold stripe through the middle. It makes me inexplicably happy that they coordinate! I can’t wait until we get to wear them all the time! 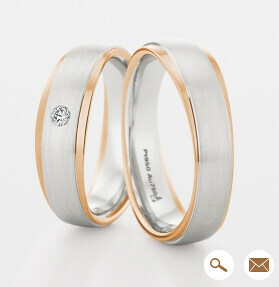 Do your wedding bands match? Do you care if they do or not? What’s that on your foot, honey? Tungsten (he’s a lighting guy, so it’s very appropriate!) and rose gold, by Kevin John. 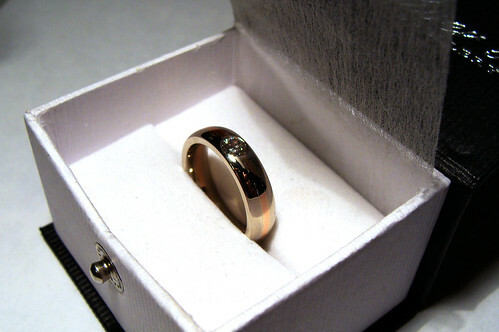 But anyway, this post is is about Cinnamon Buns’ wedding ring! It came in at last! 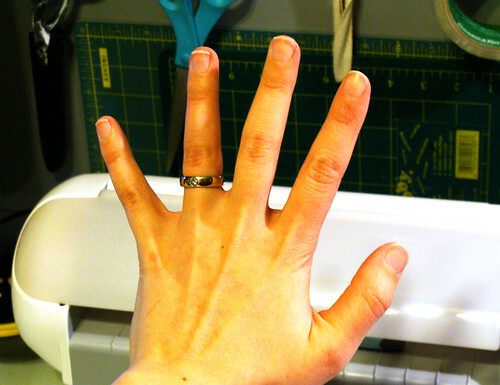 It has come in before though… we got his finger sized when we started my custom ring process. When we went back to pick up my ring, we ordered his, and because we were talking to a different member of staff that day, the new guy wanted to check that the ring size we had written down was right. The size he came up with after putting Cinnamon Buns’ fingers in their measurers was 7.5. The first employee we’d talked to had said he was an 8. Now what? We decided to order the 7.5 ring, because you don’t want your ring to be loose, right? Well, that was too tight. So it got sent back, and the size 8 got shipped in. We both went to the store to pick up his ring, and when he tried it on it was…. too loose. 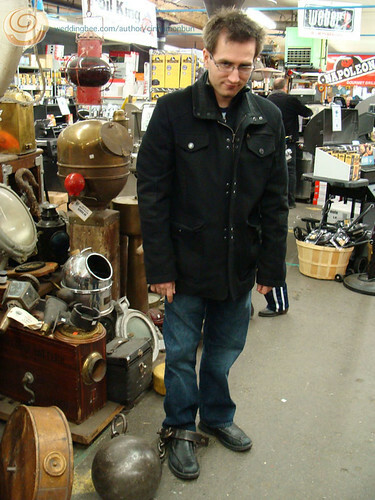 We thought it might be because his fingers were cold, so we walked around the mall, held on to a hot tea mug, and hoped it was the right size. The lady in the store said not to put it away when we got home, but to wear it for a couple days to make sure it was the right size. He gets to wear it? Before the wedding?! I sneakily tried mine on when Cinnamon Buns wasn’t home when it was in our house! I didn’t wear it! But then again, mine fit me perfectly. Cinnamon Buns wore the size 8 for a few days, and after a day and a half we almost thought it was the right size, then he went to wash his hands in the bar and it popped right off. He saved it, luckily, but that shook our confidence. The next morning, shampooing his hair, it almost popped off again. It was the right size in the morning, after wearing it all night, but during the day it did get pretty loose. And as he works with his hands, showers, and washes his hands regularly, too loose is only a recipe for a lost ring. 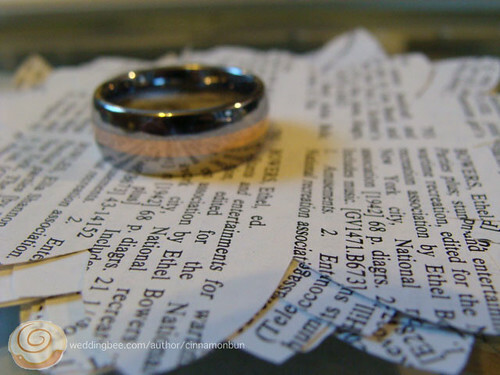 We’re not sure what the next step will be – this ring company doesn’t do quarter sizes. I’m wondering if we should take the 7.5 home for a 2 day test drive, but he said that when he put that one on in the store it didn’t come off until they soaped up his hands and pulled really hard, which does sound too tight. 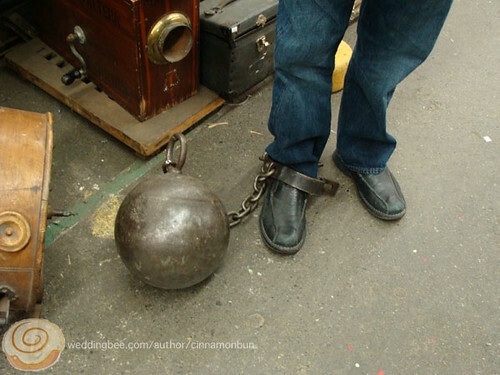 We’re heading to the jeweler again soon to get this sorted. We both really like the design, so we’re hoping something can be worked out and we don’t just have to find a totally new ring. How easy was fitting your/your fiance’s ring? Ring Around the Cinnamon Bun! We picked up my custom wedding ring today, hive! I’m so excited! 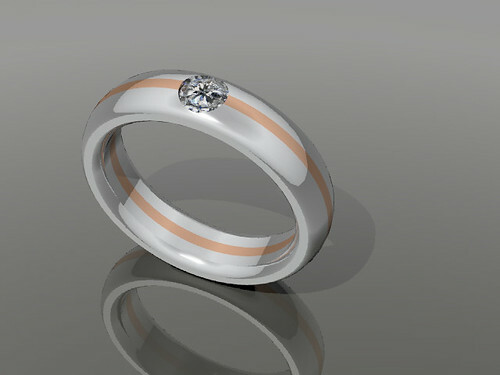 I decided that centering the stripe was probably the best idea, and I liked how this ring was smooth. Some of the others had the stripe recessed or sticking up, but I would fiddle and pick at that until my fingernails fell off, I’m sure! 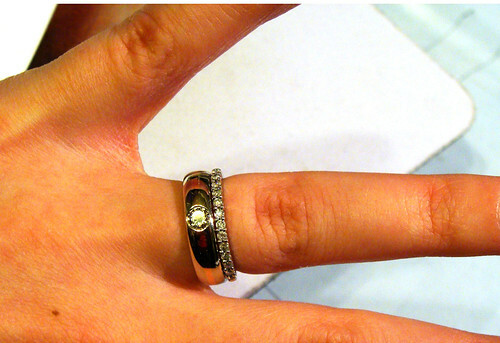 We took that photo (and some of the others from the post I linked to above) to the goldsmith, and there they measured the diamond (I don’t know its carat weight, they just took the physical measurements) and we talked about how thick the band would have to be to fit it, and how much ring I wanted either side, etc etc. I said that I didn’t really want a ring wider than 5mm but the diamond was wider than I expected (oh, to have such problems!). I’d tried measuring it with a ruler while it was still in the old setting… have you ever tried to measure something tiny, sparkly, and clear with an 18″ metal ruler? It’s hard. They had fancy caliper thingys that measured to points of a mm. They said that it could be 5mm, but it wouldn’t have the same proportions as my inspiration photo. I said, ok, they checked my ring size, and Cinnamon Buns and I left the store. At that point, I felt like I should have talked to them more… how would they know what I really wanted? Could they really tell from a couple pictures? I never actually talked to the goldsmith, just employees! What if something got lost in a game of telephone?! Awesome! For some reason I was expecting something way more pixel-y, just an outline in green on a black background. This is practically a photo! This was when we had the chat about rounded edges/comfort fit/shape. 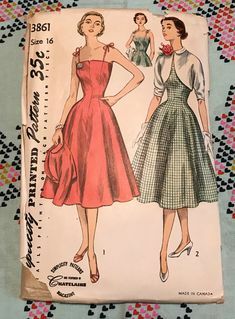 They had done what they thought best (rounding the outside a little, and making it a comfort fit on the inside) which was what I wanted but never actually expressed in the first place. The stripe was wider than I’d thought originally, but I liked the look of the render, so we took the plunge and put half the money down so they could actually start making it. 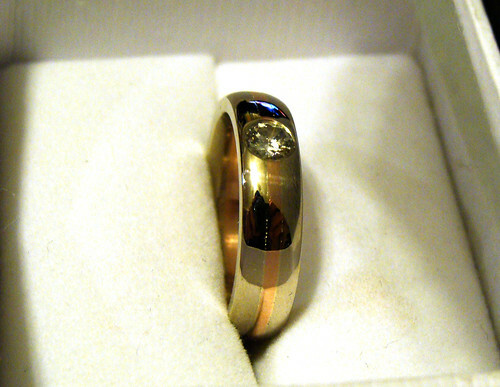 It is white gold, although it looks darker in all these pictures, it’s just dark in our house. The rose gold band is much more subtle than I thought it would be – in some lights you can’t tell it is there, but in others you can completely see it. I think that is mainly because is is mirror-shiny-finish right now. You can see Cinnamon Buns taking the photos in it! Here’s one to show how wide it looks on my fingers. Plus all the scissors and craft mats and tape hanging up behind my desk. And how I’m planning on wearing them, come June. It is so hard not to just put it on and wear it right now! We brought it home today from the jeweler’s, but we’re going to take it back and they’re going to keep it in their safe (along with Cinnamon Buns’ ring, which we ordered while picking up mine) until the wedding. That makes me feel a little safer, and it will keep me from trying it on every day. The custom wedding band process was way easier than I ever thought it would be, I totally recommend it to anyone wanting something super-special. Was/Is your band a custom one? Your engagement ring? Cinnamon Buns and I have started to plan our ceremony. We’ve borrowed the headings from Mrs. Cherry Pie’s ceremony to give us a place to start. At the moment, we’re not so much writing as just copying and pasting things we find that we like under the proper headings. Later we’ll go through, edit, change stuff, and really make it our own. Something that is important to me (well, both of us!) is that our guests are involved. I don’t want them to just sit there, like an audience at a show. Waaay back in the summer, soon after getting engaged, I heard about ring-warming ceremonies, and that just clicked so well for me. Basically, you pass the rings around all your guests, and they take a moment to hold your rings and think good thoughts over them. When you get them back, they are physically warm from being held, and full of good wishes for your marriage. I was a little scared to bring it up with Cinnamon Buns, in case he thought it was too ‘woo woo la la’ (my term for what my mum calls ‘New-Age-y’). Luckily, he thought it was a great idea too! Ms Seahorse wrote about her ring-warming recently. I think the ring-warming will be a good fit for us, as we’re only expecting about 65 guests. We have written in a little paragraph in the ‘intro’ part of the ceremony explaining what we want people to do with these rings, and they’re going to be passed off right after that. That means they should hopefully circle the room and come back to us by the time we need to exchange them. We also need to decide where to start them! It makes sense to me to start them in one of the first rows of chairs, then they’d slalom back and forth on that side, before someone in the last row crosses the aisle and starts them at the back of the other side. 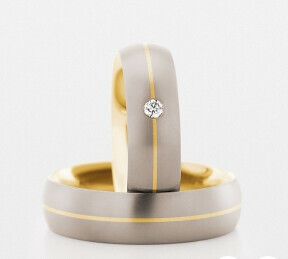 I like the symmetry of the rings starting and ending with our parents, but which side will be which? 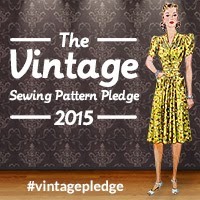 To keep the rings safe from dropping and rolling away, I’m planning on finding a gorgeous vintage book and tying a ribbon around it with a nice bow. Then I’ll attach the rings with another ribbon looped around the bow. I could tie them directly to the book, but I want some slack in that ribbon so people can actually hold them in their hands. We’ve started writing our own ceremony text for the ring-warming, to make it just right for us. We are having a secular wedding, as we’re very secular people and so are most of our friends, so neither of us was quite comfortable asking for people to pray over the rings. We did both agree that we were okay with the word ‘blessings’ though. Blessing is also a good word, because those of our invitees who do have more of a relationship with god and faith will take it one way, and others can bless in their own way. Once the wording is more final, I’ll post it here, but basically we are asking for their blessings, good thoughts, and best wishes. We could talk about infusing them with energy and life-force, but that might get a bit ‘New-Age-y’ for some, and I want everyone to feel comfortable with it. I think we’ve definitely made a good start at it! Did have, or have you been part of, a ring warming? 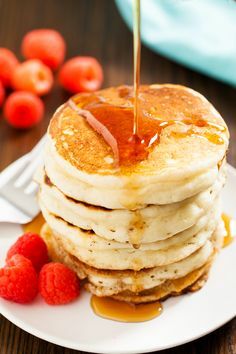 C’mon, you saw that post title coming a mile away, didn’t you? 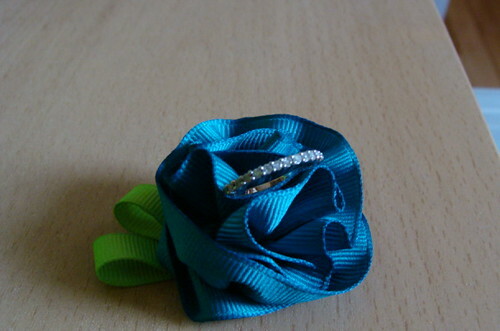 My ring in a grosgrain ribbon flower I made. We’d never talked about rings at all – he picked it himself, and I love it! He had lots of good thoughts about it, which just shows how well he knows me, and how much thought he put into this. 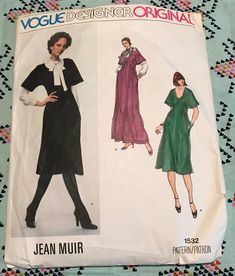 He wanted something low-profile, so I could wear it to work and not worry about it poking things or getting bashed around. 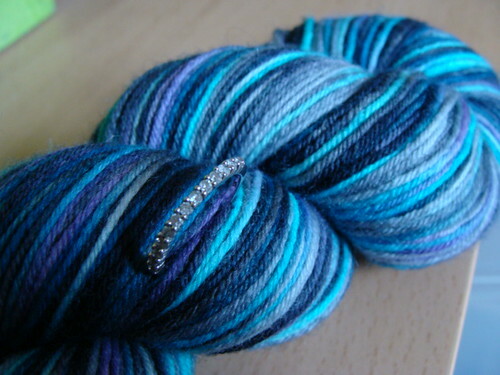 This also means it won’t get caught on my knitting. I like that I don’t have to take it off at night for fear of scratching either of us. He knows that I don’t own any yellow-gold jewelery, which is very observant of him. He apparently got opinions on photos of a couple rings from one of my friends, and I think his mum as well. 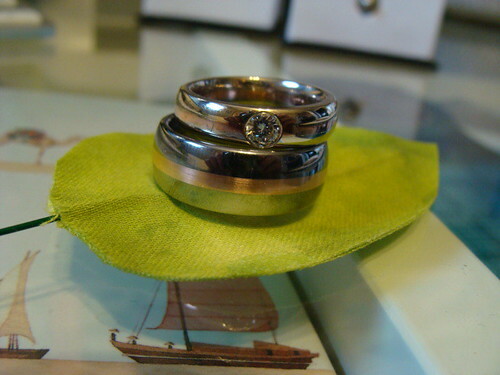 He also asked my friend’s ring size, and took my grad ring from my jewelery box to check the size! He got it right (amazingly, my grad ring is too tight!) and the ring fits like a glove. Or a ring. He also had another surprise for me – when his mum found out he was planning to propose, she gave him one of his granny’s rings. 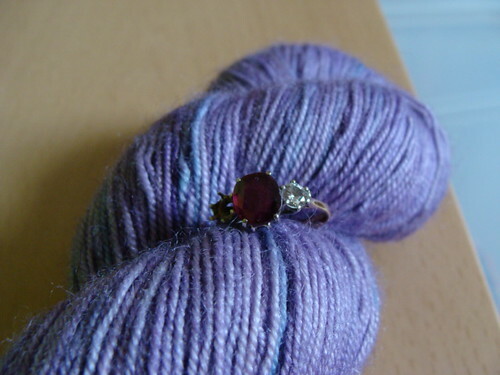 It was a ring with a large red stone (I don’t know if it is ruby or garnet, to be honest) with two smaller diamonds on either side. One diamond has been removed, and resides in his step-dad’s wedding ring. The remaining diamond and red stone are for me! When he proposed, he said we could return the ring if I didn’t like it, we could get it remade with granny’s stone put it, we could start from scratch, we could do anything. Now let me just say, the e-ring was not what I’d ever imagined (although I have never really daydreamed about jewelry, because I don’t wear it) but NO. WAY. was anyone going to take it away from me. I think it is perfect, all the more perfect because of how much thought P put into it, and because he chose it on his own, just thinking of me and what I like. I think that makes it pretty damn special. The last one is my favourite, although I would not have the brushed finish. I think it would show scratches more than a shiny one – just think about brushed stainless steel fridges! 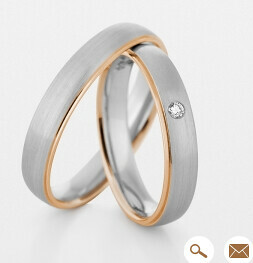 Also, I think CB uses platinum – I will be going for the much-less-spendy white gold. We haven’t made the appointment yet, but we know which jeweler we will go to when we want to start the ring-making process. We’re thinking of getting it done in the next month – we are all about getting stuff done early. 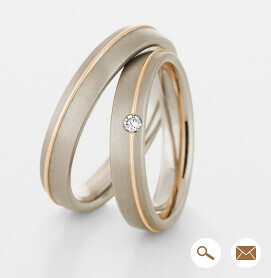 I’m hoping that the wedding ring will be thin enough for me to wear stacked with the engagement ring. 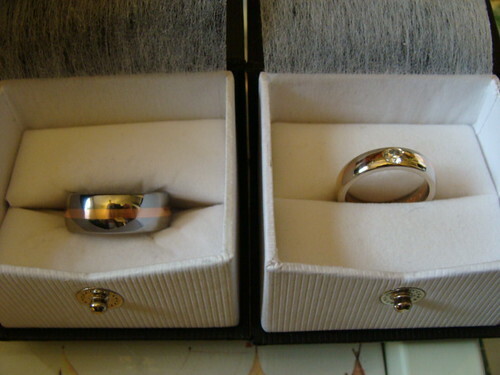 For some reason, I’m attached to the idea of wearing them both on the same finger. Coming up with a design for a custom ring out of nothing was so hard it stressed me a little, and then I put off thinking about it for a while. It was then that those inspiration pictures found me, and boy did they help. I think it helps everybody involved (you, fiance, vendors) if you can have concrete pictures instead of just hand waving. I think even pics of what you don’t want are just as helpful! Mr Cinnamon Buns and his mum wouldn’t be offended if I didn’t have the stone made into a wedding ring, but I think it is such a great link to his family history that I can’t say no, even though that Tiffany ring still calls to me sometimes. I’m hoping that having my ring custom-made will give me the best of both worlds (history, and the mixed-metal look I love). 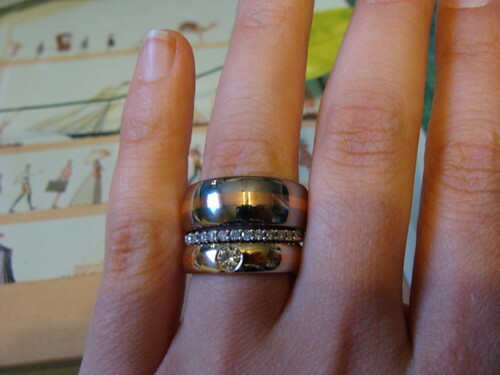 Are you designing your ring(s)? How do you feel about mixed-metal jewelery?